&apos;Mother and Child&apos; group exhibition brings back the focus on the Woman, on maternal relations and on female iconography in the art world. The Mother and Child group show will be held both at Dorothy Circus Gallery Rome and London and will showcase the works of more than thirty of our most famous and coveted International artists, such as: Adrian Cox , Andrey Remnev, Amandine Urruty, Aron Wiesenfeld Audrey Kawasaki, El Gato Chimney, Handiedan, Hyuro, Jade Rivera, Jana Brike, Javier Calleja, Jeffrey Chang Wong, Koh Kisung, Kukula , Marion Peck, Mark Ryden, Matthew Grabelsky, Nouar, Peca, Ryan Heshka, Sean Mahan, Sergio Mora, TvBoy, Andrea Wan, Andrea Kowch, Camilla D’Errico, Jon Jaylo, LeValet, Luke Chueh, Javier Calleja, Olga Esther, Rafael Silveira, TvBoy, Yosuke Ueno. 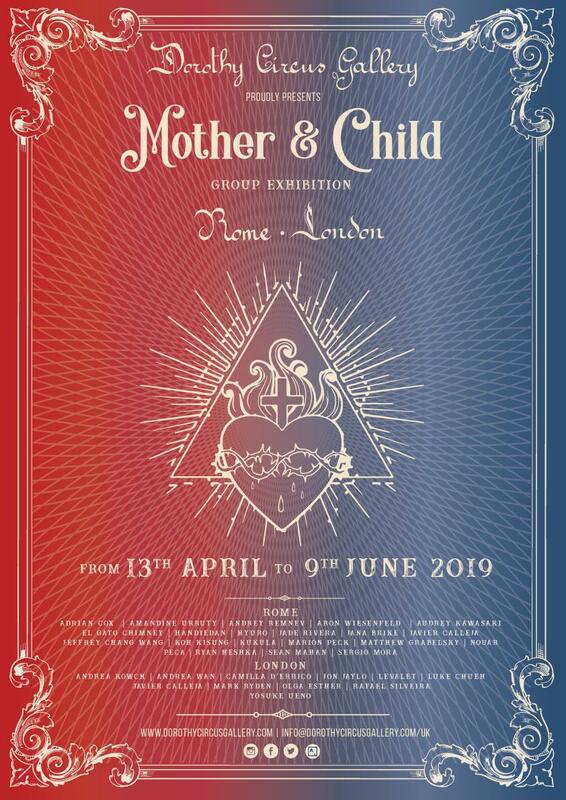 The evocative collection of artworks exhibited in Mother and Child offers an opportunity to explore the theme of motherhood in its deepest sense, visualising the paradigms of our time, through an overview of the latest philosophical and sociological trends. The language is that of hyper-contemporary art that ranges from the most evocative and extravagant Pop Surrealism, to all forms of contemporary creative research which manifest themselves in the New Figurative Art, the provocative Urban Art, and the increasingly innovative Asian Art. Art history has offered an inevitable starting point for this curatorial and artistic representation, which takes inspiration from the most famous and influential representations of the Madonna and child. On the one hand, from these subjects arises a profound reflection on the theme of motherhood, deeply connected to the spiritual image of the woman as a symbol of love, forgiveness and compassion. On the other hand, the representation of motherhood, intended as both a generating and conservative force identifiable as Mother Nature, is strongly detectable. Motherhood and childhood appear as intrinsic characters of this puzzle that is the complex relationship between a mother and her children. But the main character itself is the maternal feeling embodying protection and care in their purest essence. Numerous stories of adoption and family are also represented, so that motherhood can be read within a broader spectrum of love, to be intended not only as exclusively maternal, but also generous and selfless, including the paternal figure as an equally important figure for the child’s development. The inevitable cornerstone is the role of the Woman and the mother in contemporary society, as well as the legacy of feminist intellectuals, activists and writers whose battles and victories we should thank for today's great awareness. Unfortunately, the battle still continues and great attention needs to be drawn to the increasing cases of feminicide, as well as to women’s rights in the workplace. “One is not born, but rather becomes, a woman,” affirmed Simone de Beauvoir, indubitably anticipating contemporary issues on gender fluidity, but also underlying the difficulties that women and mothers find themselves having to face when it comes to forming their own identities within a society that often hinders them. An identity that is not meant to be only personal, but also collective.